While on tour in Europe, musician Boots Riley made a stop at the International Institute for Research and Education (IIRE) in Amsterdam to give a talk on the politics of Occupy. Until 2011, Riley was known principally as the front person for outfits The Coup, a hip-hop duo known for its political lyrics, sharp wit and funky beats, and the Street Sweeper Social Club, a collaboration with Rage Against the Machine’s Tom Morello. Though Riley had always been a political person, calling himself a communist and holding at times membership in the Progressive Labor Party, it was not until the spread of the Occupy movement that Riley became a movement figure on the national scene, often writing and engaging in debates over his personal facebook page. In this talk, Boots Riley talks about his encounter with Occupy Wall Street and his involvement in Occupy Oakland. 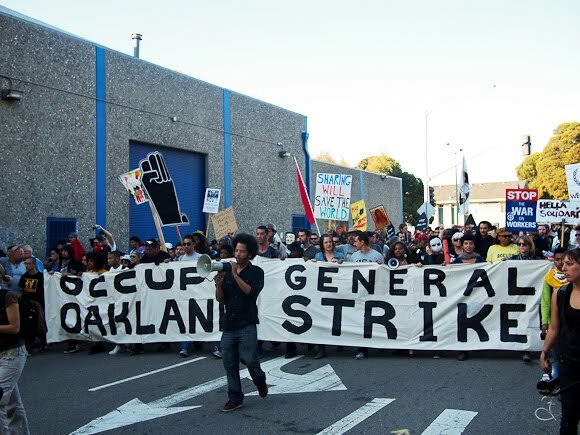 Riley focuses on the relationship between Occupy and ports on the west coast, explaining the context of the mass converges and the International Longshore and Warehouse Union (ILWU), all the while discussing left organizing and the need to return to the working class. The video ends with special footage of The Coup’s performance at Studio K, a youth hostel around the corner from the IIRE. Public Talk by Boots Riley and The Coup in Concert from IIRE on Vimeo.